Malayala Manorama Thozhilveedhi 13 December 2014 issue (8 December) is now in stands. To read the latest issue of Malayala Manorama Thozhilveedhi dated 8 December. Thozhilveedhi from M M Group is one of the popular employment weekly which features updated news on arising opportunities in public and private sectors. 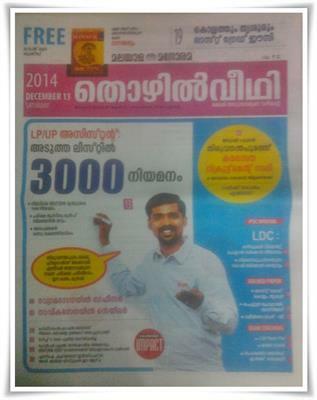 Thozilveedhi is one of the prominent employment newspaper which is being read by job seekers in Kerala. The 13th December 2014 issue of Thozhilveedhi comes with new job prospects in both government and private sectors. The latest edition of Thozhilveedhi is thickly packed with jobs in CUSAT, RSIC, CEDAC, AIR Force, Navy and South Western Railway. Fresh appointments in Sree Chitra, Kannur University and M G University and Calicut are also reported. Going through the pages, readers can find latest job opening like 14 Lecturers in CUSAT, Project Engineer in CEDAC, 133 Telecommunication Consultants, Officer in Air Force, Sailor in Navy, 46 in South Western Railway, 2 vacancies in ESIC, Sree Chithra, Lecturer in M G University and Project fellow in Kannur University. LGS rank file prepared by Lakhsya Academy, IBPS PO exam orientation by TIME, LP/HSA,DEd & Pre Primary Nursery Teacher exam guidance provided by Florence Academy will boost the preparations of the candidates. In the PSC special section, news about reporting LDC vacancies is given with prominence. Solved papers of Last Grade Kollam, Thrissur, Computer Programmer Beverages and Railway Group – D are published in this issue. Exam coaching of Cooperative Service Clerk, Secretary Bank exam and LGS rank film will provide guidance the job aspirants. Regular columns like Open Forum, PSC for Beginners, Syllabus of various upcoming Kerala PSC exams and Hall Ticket details have proved to be beneficial for the PSC aspirants. As usual, the questions put forward by the readers are answered by PSC officers. The free booklet 'Competition Winner' richly filled with the most recent General Knowledge is accompanied with this issue too. 'Thozhilveedhi' had been providing the basic support for many youngsters to live their dream. More than being an active guide, this newspaper proved to be a foundation block for those who are aspiring for a first-rate profession.